Neil McGee doesn't boast about any part he played in convincing Jim McGuinness to remain on as Donegal manager after last year's disappointing campaign. McGee and Michael Murphy were en route to an International Rules training session with the Ireland squad when they decided to turn their car around and head back to Donegal. "I suppose Michael wanted to get it sorted," recalls McGee. "But we all met up as a group a couple of times and got it sorted." McGee adds: "Jim was in two minds but we really forced him to stay more or less." McGuinness had talked openly about stepping away from the Donegal role after they surrendered their All-Ireland title in a quarter-final humiliation by Mayo at Croke Park. The Donegal boss felt that the staging of club championship games in summer had completely undermined their defence of the Sam Maguire Cup with injuries also badly affecting participation rates at county training. "The kind of driven character Jim is, he has standards set and they weren't met last year and we had to get back to those standards. "We have probably twice the amount of training sessions done this year [compared to last]. "We were probably in a poor place last year." McGee and his team-mates managed to convince McGuinness that they were committed to regaining their standards of 2011 and 2012. "We met and as a group asked ourselves what our objectives were. "We knew some of the boys were coming near the end of their careers but we said that we would give it one more big lash." That decision has proved inspired as this Donegal team stands on the brink of a second All-Ireland Football title in three years. McGee acknowledges that the thought that it might be over for the team did cross his mind after the 4-17 to 1-10 hammering by Mayo 13 months ago. "You will get a lot of doubts after thrashing like that. "But as the weeks ago on, you started getting a bit more of the hunger back. "You start to look back at what you did wrong and you then meet as a group and discuss what you did wrong as a group. "We've righted a lot of those wrongs this year. We just didn't have the work done last year. "In saying that, we came up against a lot of good sides last year but we have the work done this year and we are where we want to be." After their stunning All-Ireland semi-final defeat of Dublin, Donegal are likely to head into Sunday's decider against Kerry as favourites and it's amazing to think the road the county has travelled since their qualifier humiliation by Armagh in Crossmaglen four years ago. "We were toiling away for years but I suppose then Jim came in. "We knew from the very first training session with him that we were nowhere near. "He brought us up to that [necessary] level. We always had talented players and there was only one way we could have gone and that was forward [after that Crossmaglen defeat]." After his impact in Kerry's two games against Mayo, one of the main tactical talking points in the run-up to Sunday's decider will be who picks up Kieran Donaghy. McGee's brother Eamon did a highly effecting marking job on the towering full-forward in the 2012 All-Ireland quarter-final and we won't know for sure what Jim McGuinness's thinking on the issue is until 15:30 BST on Sunday afternoon. Neil has a high regard for Donaghy the footballer and human being. "Everyone knows the [football] quality he has and he's a great fella actually. A really nice lad. "He has really given them that extra dimension since he has come back in this year. "He came on at half-time against Mayo the first day and you could see him turning the game nearly straight away. "Then he was exceptional in the replay. 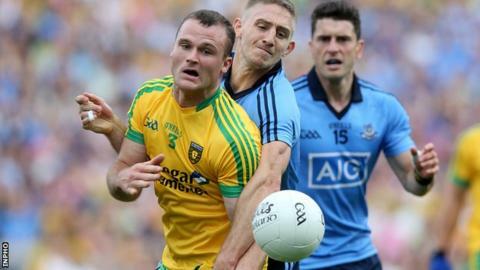 He nearly won every ball going into him and that's serious when you are coming up against a quality team like Mayo." The presence of Donaghy and a host of other hugely talented Kingdom performers means that McGee is expecting a "huge task" in Sunday's decider. "You are in an All-Ireland Final. It's top level sport so it's going to be a tough task no matter who you play."